After my meal at Petrossian the previous week, I was reminded of Chef David Gussin. Gussin was Ben Bailly's former Sous Chef and is the current Executive Chef at The Six, a new "gastrobistro" concept located in the old Jack Sprat's Grille space on Pico. 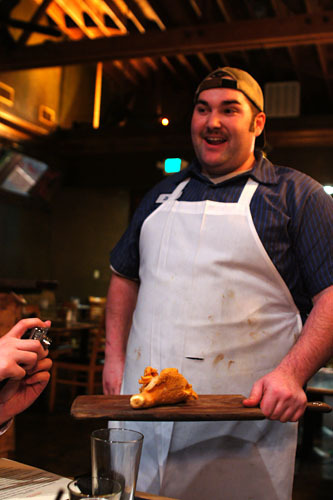 The restaurant, which soft-opened in December 2009, is the brainchild of Will Karges (Johnnie's Pizza, Jones Hollywood, Circle Bar), Jake King (Rix Cafe, El Dorado, Drake's), as well as silent partner Devin Klein. The name is based on the so-called Society of Six, an early 20th century group of modernist en plein air painters based in Northern California. In addition to their groundbreaking art, the Society was also known for its legendary meals at the artists' meeting place, the "Chow House." About the Chef: Originally hailing from the San Fernando Valley, the 25-year-old Gussin moved to South Pasadena at age 11. 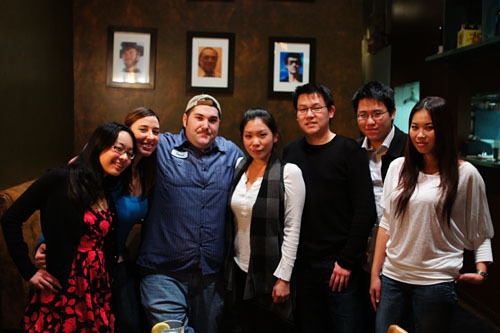 After graduating from South Pasadena High School, he studied business at the College of the Canyons before enrolling in the Le Cordon Bleu program at the California School of Culinary Arts. Afterwards, Gussin landed a Chef de Partie position at Norman Van Aken's Norman's on Sunset. Here, he worked for 10 months under Chef de Cuisine Michael Bryant (Father's Office, Joe's, Bin 8945). Just before Norman's shuttered in November 2006, Gussin moved to Chicago, where he spent another 10 months cooking with Carrie Nahabedian at Naha. 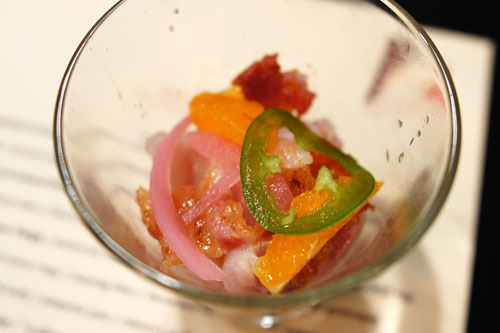 In July 2007, the Chef transitioned to DeLaCosta, where he worked under Douglas Rodriguez as a lead line cook. It was here where Gussin would truly come into his own, putting items on the menu and expanding the scope of his culinary creativity. Los Angeles beckoned, however, and the Chef moved back to LA in November 2008, finding work at Akasha Richmond's eponymous eatery. Gussin toiled at Akasha as a Sous Chef for five months before joining Benjamin Bailly as Petrossian's Sous. Finally, in October 2009, Gussin left Petrossian to work his first Executive Chef position at The Six. Rounding out the team at The Six are Sous Chef Daniel Somoza and General Manager Mitch DuRette. 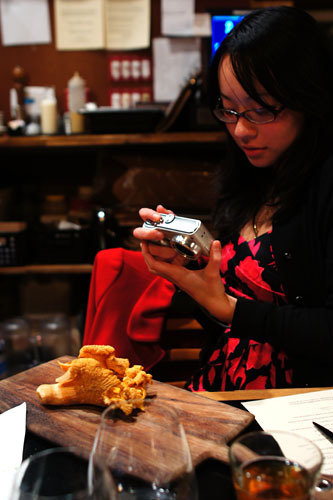 In January, I was invited to do a media tasting at The Six by co-owner Jake King. Joining me were Amy of Journey of an Epicurean Cutie, Christie of Pardon My Crumbs, Helen of I'm Hungry, Ryan of Epicuryan, and Tsz of Gastrophoria. The owners did a nice revamp of the old Jack Sprat's, transforming the space into something befitting of a gastropub-bistro hybrid. It's a homey, rustic room, punctuated by a vintage wooden bar surrounded by recycled wine crates, photo collage-wrapped sconces, and bare Edison light bulbs dangling from iron pot racks. Under Gussin, The Six stresses the importance of seasonal, sustainable, farm-to-table produce for its New American menu, with nearly everything made in house. 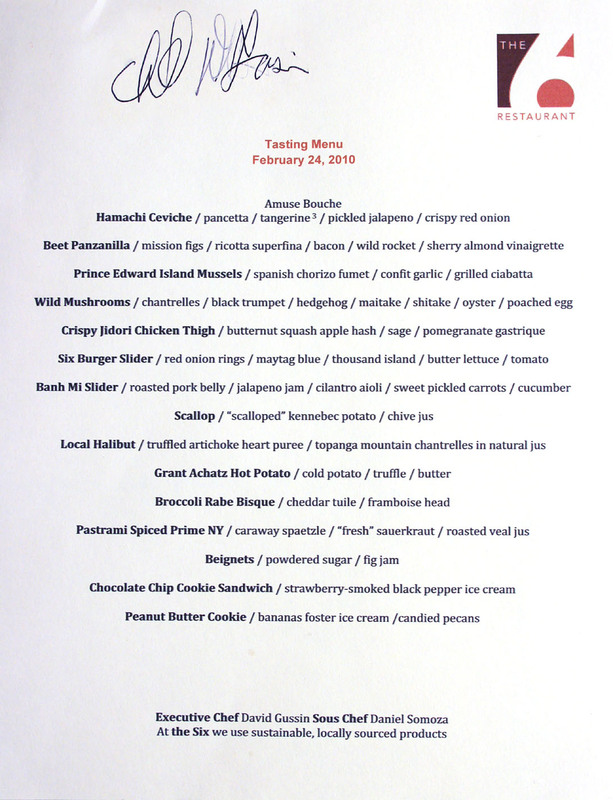 As such, the carte changes periodically, and we were able to catch some of the winter menu, with a bit of the spring selection thrown in for good measure as well. Gussin also included a smattering of off-menu specials. Click for a larger version. 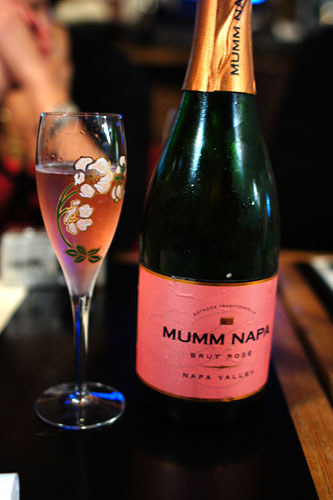 To begin, were provided with a bottle of the Mumm Napa Brut Rosé, a tasty, easy-drinking sparkler with prototypical strawberry and citrus notes intermingled with a bright, light acidity. We started with a dish inspired by Gussin's time working for Doug Rodriguez in Chicago. Compared to traditional ceviches, in which the fish may marinate for hours, the version here only began "cooking" in lime juice from the time we sat down. 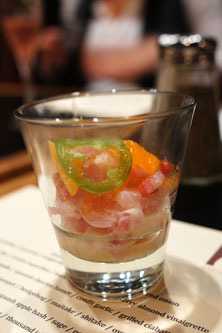 The end result was a simultaneously sweet and sour interplay between the citrus and the comparatively mild fish. I appreciated the use of tangerine (juice, supremes, candied zest), but the key here was the pancetta, which added a lovely salty accent and a great crunchy textural element. The fish, however, should've been cut into smaller pieces. 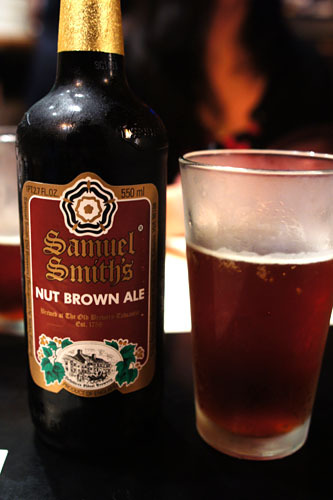 Paired with the mushroom course was Samuel Smith's Nut Brown Ale, a classic brown ale with marked coffee notes leading to a rather savory finish (which Tsz described as being "soy sauce"-like). 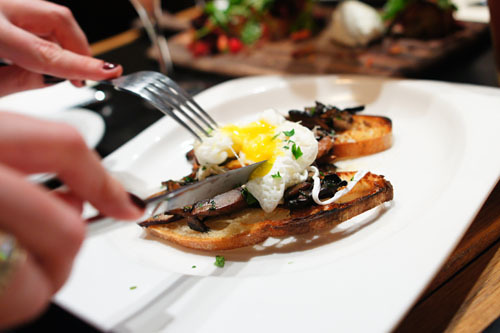 We have here a mélange of locally-foraged mushrooms, reminiscent of a similar dish that I had at Father's Office. 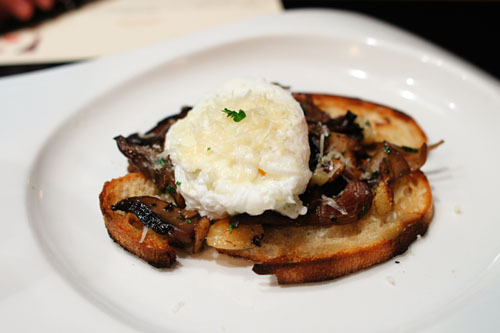 I really enjoyed the various tastes and textures of the fungi, while the egg added a fantastic, overarching luxuriousness to the dish, a perfect complement to the earthy weight of the mushrooms. This was one of the table favorites. Here was Gussin's version of the classic Italian bread salad dish panzanella. 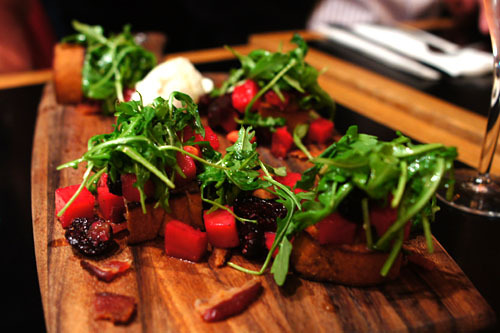 Beets were used to give the salad a more "wintery" character, as traditionally, panzanella is a summer dish. I'm generally not a huge fan of beets, so I was glad to find that they weren't too overpowering here. Instead, the beets were nicely tempered by the bitterness of the arugula and the sugariness of the figs especially, while the ricotta provided a lovely, creamy accoutrement to the course. The bacon, meanwhile, gave things a sharp, salty accent. 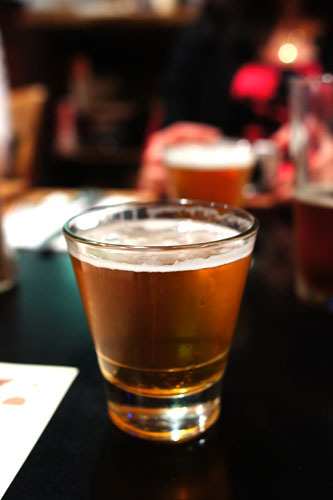 Our next beer was the Stone IPA, on draught. Think loads of bitter hops, with some spicy, citrus flavors as well. One of the highlights of the meal for me was this perfectly cooked chicken thigh. I loved its juicy, tender, succulent flesh, enrobed in layers of fantastically crisp, savory skin. 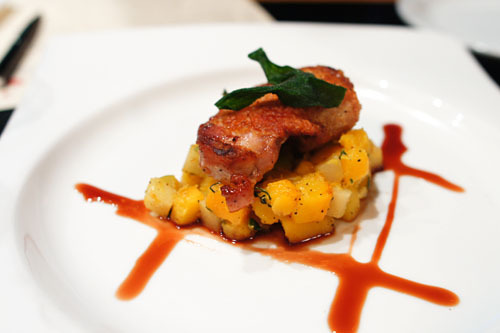 I was even alright with the squash-apple hash, which I had feared would be overly sweet. 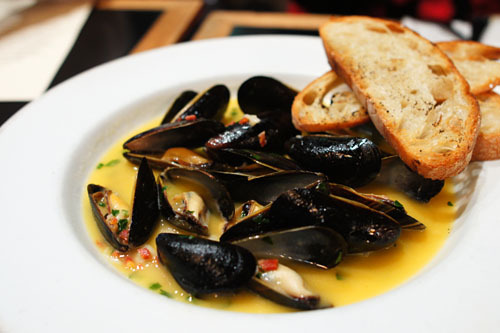 Lately, I've been having good luck with mussels, and this dish merely continued that trend. Delicately briny in savor, the mollusks were deftly complemented by the subtly spicy, garlicky fumet, which Gussin made from halibut bone stock. 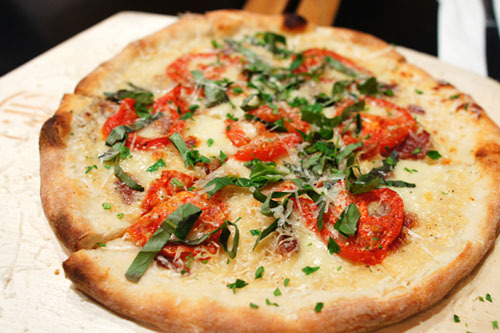 BBT: bacon / basil / tomato. Of note here is the Louisiana-sourced bacon, which Gussin chose over Hobbs' (a staple bacon at fine dining restaurants, including The French Laundry). Indeed, the bacon formed a fitting foil to the pungency of the basil, and I quite enjoyed the sweetness imparted by the tomato, as well as the bitter char of the crust. Overall, a very solid pizza. 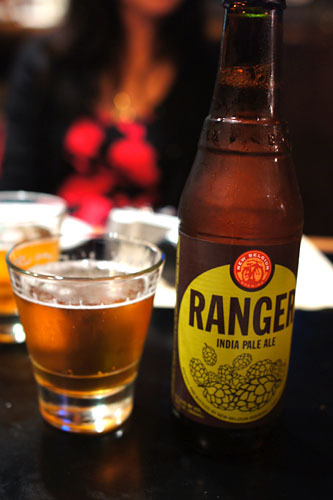 To drink, New Belgium's Ranger IPA from Fort Collins, CO was next. Compared to the aforementioned Stone IPA, this was fruitier and softer, with a great, balancing maltiness. 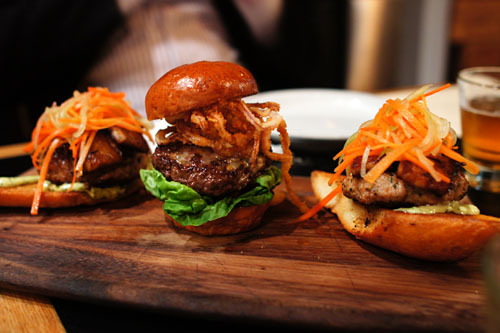 Miniaturized versions of two of The Six's burgers were next. I first tried the Six Burger, basically the restaurant's take on the classic hamburger. 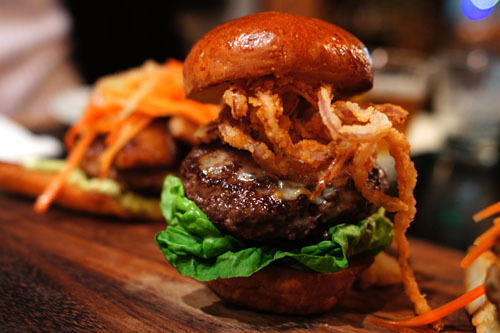 Start with a tender, flavorful patty, cooked rare, augmented by the sharp tang of blue cheese. Then add in the crispy astringency of red onion rings and a slice of juicy tomato, all tied together by a dollop of thousand island. 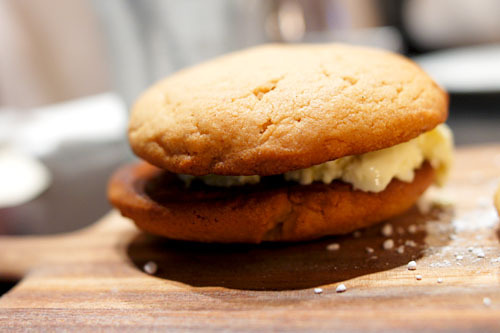 Classic flavors, aptly executed. 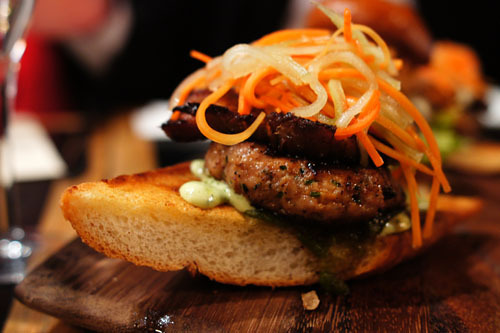 This burgerized version of the classic Vietnamese banh mi was one of the dishes that helped Gussin secure his job here. The burger begins with a subtly-flavored, slightly vegetal pork patty, to which Gussin adds pork belly, giving the dish more heft. The tanginess of the pickled vegetables works as an effective temper to the gravity of the meat, but I would've liked to have seen more spice, and a more apparent use of cilantro. 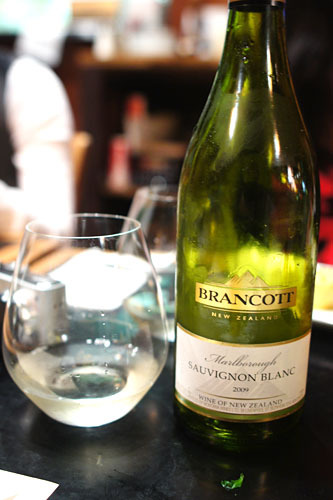 For the scallops, a 2009 Brancott Sauvignon Blanc from New Zealand, with its fruity, floral character, was the chosen pairing. 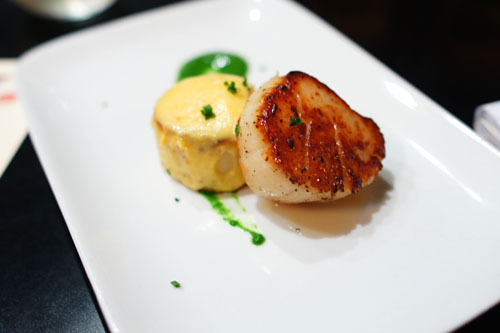 We had here a single seared diver scallop, as well a faux scallop composed of a kennebec potato cylinder topped with mornay sauce. The scallop itself was deftly cooked, preserving the bivalve's natural brininess and sea-tinged sweetness. The crux of the dish, though, was the potato and its cheesy topping, which added a fantastic weight to the course, especially when set off by the tang of the chive jus. 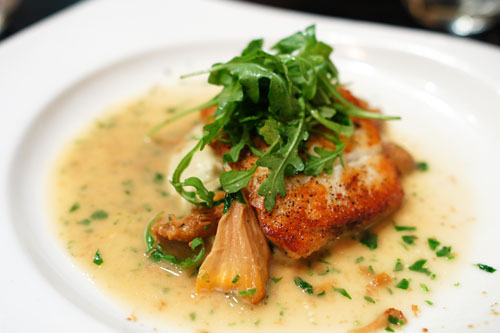 ...A lovely preparation of Santa Barbara halibut. The fish itself was suitably tender, succulent, and beautifully flavored--I would've been happy just eating it alone. However, the dish was made even better by the earthiness contributed by the mushrooms, as well as the bitter tang of the arugula. Very nice. 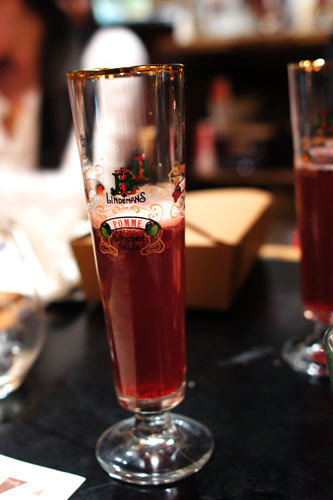 Our next libation was the classic Lindemans Framboise, a Belgian Lambic with loads of sugary raspberry. 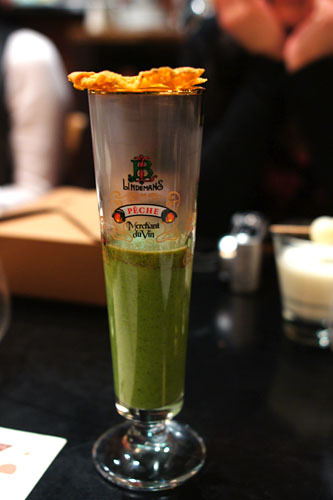 Served in the same glass as the Lindemans was a soup of broccoli rabe, a.k.a. rapini. Taken alone, the bisque was quite pungent, bitter even, and rather overpowering. Thus, the cheese tuile was absolutely key in tempering the power of the rapini--it completed the dish for me. 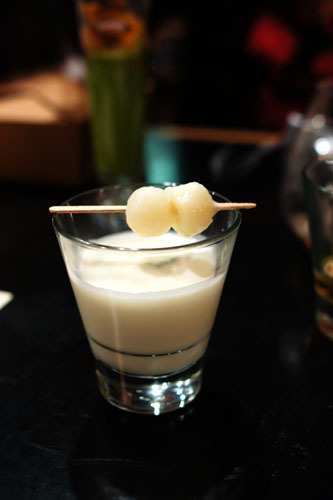 Here was Gussin's homage to Grant Achatz's legendary "Hot Potato Cold Potato" dish at Alinea. After dropping in the spheres of potato into the gritty, vichyssoise-esque potage, I enjoyed the interplay between the warm, mild potato and the cool, truffle-tinged finish of the soup. 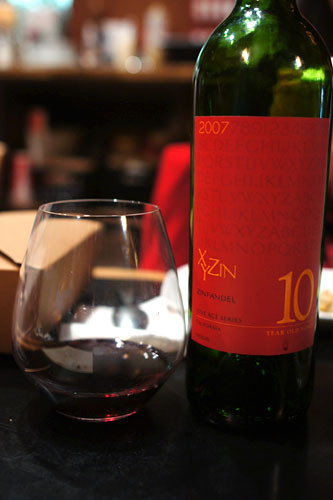 The final tipple of the night was the 2007 Xyzin Zinfandel 10 y.o. Vines, a delectable, juicy zin loaded with dark fruit and a bit of peppery spice. Our last savory course was also one of my favorites. Based on the food that Gussin ate while growing up, this is his seemingly Moto-inspired deconstruction of a Reuben sandwich. 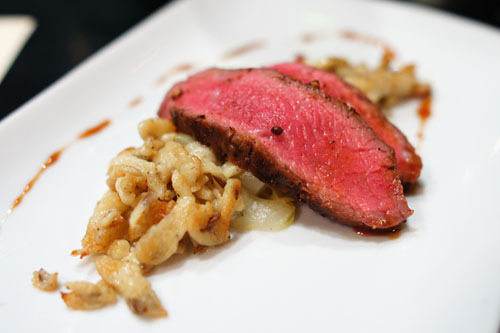 The star here was clearly the perfectly cooked NY steak, done up with smoked pepper and salt. At the same time, the lightly tangy "sauerkraut" provided a great counterbalance to the meat, while the spaetzle was absolutely key, deftly emulating the essence of rye bread. Superb. To conclude, a troika of dessert was brought before us. 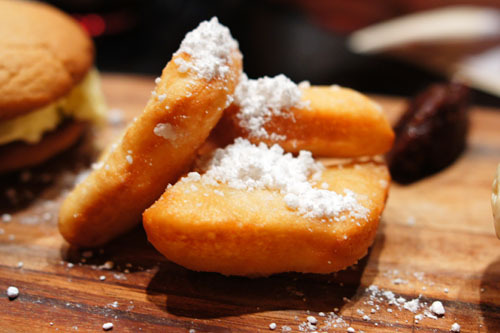 First up were beignets, dusted with powdered sugar and served with a quenelle of fig jam. Sweet and unctuous even, they reminded me of Chinese style you tiao! The problem here was that the cookies were far too hard--the dessert would've been markedly improved had warm, softer versions been used. Tough cookies notwithstanding, I adored the actual ice cream, with its subtly sweet strawberry flavor, tinged with just a hint of pepper. Peanut butter doesn't sit too well with me, so naturally, I wasn't too keen on this last dessert. Nevertheless, I did appreciate the banana ice cream, as well as the bit of sweet nuttiness imparted by the pecans. The Six's open kitchen is certainly on the small side. Most of the time, Gussin works solely with his Sous Chef Danny Somoza, though on busier nights, a third cook can be called in. Surprisingly, the Six actually managed to exceed my expectations. 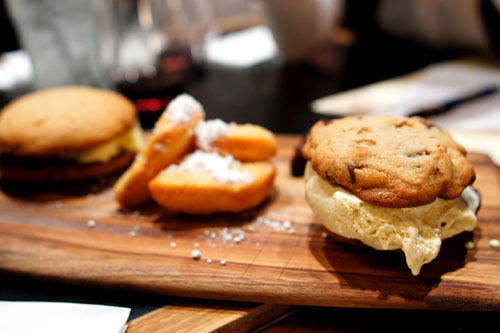 The food is not without faults, but there's plenty of stuff that's going right here. I was very wary going in, but Gussin definitely knows what he's doing in the kitchen. If he can continue to deliver the energy, excitement, robustness, and flair that I experienced, then we'll have a winner on our hands. That looks off the hook. More up my alley in terms of a mix of fun and high concept cuisine than, say Melisse or Providence. Questions: who foraged the mushrooms for him? Does he know where they were found? Also, did he create the menu to your specs or were you his guinea pig? Wow, this place seems really close to my old place in West LA yet I wasn't really aware of it. Looks pretty good though based on your experience, I should check it out one of these days. That's a huge portion! How did you manage? Kevin, you mentioned in the post that you were invited to do a media tasting in January. Did you mean to say February seeing as your menu was from 2/24? It seems like every time you get a dish with beets you say, "I'm not usually a fan of beets but in this case they were not so sweet." Why don't you just admit that you love beets? Another testament to how good The Six was: when their leftovers reheated in the microwave were able to invoke the same feel as the actual meal. And I agree wtih you... I absolutely loved the chicken, but thought the hash was a bit sweet as well. and i'm definitely going to order the BBT again. 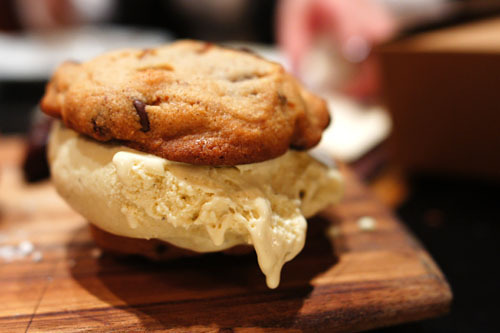 Ok Wil I am so hungry now!! If I was there I would be in my car now on my way to The Six!! Looks & Sounds amazing see you in a few weeks!! Great post! The chantrelles were truly out of this world, as were the "scalloped' potato and crispy chicken thigh. I'm looking forward to returning and trying David's version of The Six burger. Perry: For sure--I'm definitely beginning to appreciate bitter! Fiona: It's worth checking out if you're looking for a more casual experience, with solid, straightforward food and some nice beers. Amy: Great meeting you finally--thanks for coming out! Jo: How do you know David? He has a picture with you on his LinkedIn! Tsz: Ha! Impressive. What did you end up taking home, anyway? Helen: Good to hear that you had a satisfying meal. Where did you end up going Friday? Juli: When/where/how will you see me in a few weeks?!? I have a "guy" who gets the mushrooms for me. I call him a day ahead, he goes to his spots and comes back with the amount I asked for. He said local morels should be ready soon!!! Same "guy" that David uses?!? Sorry, Kevin; that was me. Ah, gotcha David. I just read Pardon My Crumbs' post--why the switch to Hobbs' from your Louisiana bacon? Hey Kevin. Just saw this. It was simply a matter mf my purveyor being out of our bacon. I have tried a few others and am a huge fan of the rich and super smoky niman ranch bacon. A bit pricey though.